Once I dove into World War I history, I found too many stories for one novel. Here’s an amazing one: Cher Ami, a homing pigeon who saved 194 desperate American soldiers in the Battle of Argonne, in October, 1918. The story is this. Five hundred US Army Signal Corpsmen were trapped in a valley without food, ammunition, radio or other communication with headquarters. By the second day, 300 had died and they were receiving “friendly fire” from American forces who didn’t know their location. Major Charles Whittlesey had three homing pigeons donated by British pigeon trainers. He sent the first two with desperate pleas for help and cessation of friendly fire. Both were shot down. Only Cher Ami was left. The message was put in his capsule and he was released, the last hope of the 200 men. Enemy troops saw him mount from the brush and opened fire, filling the air with bullets. He was hit and fell, but then, amazingly gathered strength, took off again, and flew through the bullets, reaching the division headquarters 25 miles away in 25 minutes. Message delivered, he collapsed, blood-soaked, blind in one eye, with a bullet in his breast and one leg hanging by a tendon. But he’d made it. The friendly fire was stopped and the now 194 survivors were rescued. Army medics couldn’t save the leg, but tended his other wounds and he survived. When Cher Ami was able to travel, General Pershing saw him off in a new cage for the trip back home, where he earned a Croix de Guerre medal and Oak Leaf Cluster for heroism. I’m not sure how he wore them. He died a year later but has been stuffed and is on display at the Smithsonian. 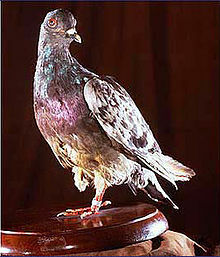 So if pigeons annoy you in a city, think of Cher Ami. I have been shat upon twice by Cher Ami’s descendents–once in Florence, Italy and again in New Orleans. Both times I felt blessed, singled out, chosen by pigeons. C.A. was a very special bird.